Install YouTube from an alternative location. 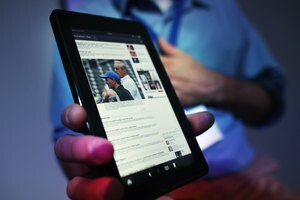 The Kindle Fire uses a modified Android operating system and comes with Amazon's alternatives to Google's native Android applications, such as the Play Store and YouTube. While the Amazon App Store doesn't offer YouTube, you can visit YouTube from the Silk Web browser or install the YouTube application from an alternative source. By default, the Kindle Fire can only download software from the Amazon App Store, and you must edit your settings to install programs from APK files. Swipe down from the top of the screen, tap “Settings,” select “Applications” and enable the “Apps From Unknown Sources” option. You can disable this option after installing YouTube to protect your device from untrusted software. Before you can install a program from an APK file, you must install a file browser to locate the file on your hard drive. Tap “Shop” and search for a file browser, such as ES File Explorer, File Manager or File Manager Free, all free applications from different developers (links in Resources). After you install your chosen program, it's added to your Apps library. Visit Tube for Tab to download the free YouTube APK file for the Kindle Fire (link in Resources). The file is saved to your root directory, and you can install it by opening your file explorer and tapping “YouTube.apk.” Select “Install” when prompted to add YouTube to your Apps library. Wayne, David. "Can a Kindle Fire Watch YouTube?" Synonym, https://classroom.synonym.com/can-kindle-fire-watch-youtube-17166.html. Accessed 23 April 2019.